If you are Foreign to Jackie Chan as an Actor, this isn’t a Bad One to Start With. The Foreigner is an action-thriller about a man desperate for answers and driven to use his particular set of skills to find them. The title, by the by, is suggestive in two ways. One of those is more obvious: The plot of the film regards the actions of the Irish Republican Army, and our protagonist is Chinese. So, indeed, he is literally a “foreigner,” at least by birth (The man mentions early on that he is a naturalized British citizen). The other meaning is sort of a joke and sort of insidious to the men who cross his path: He is the unknown variable in their midst. In other words, this is a reliably efficient action-thriller, and casting Jackie Chan in the part of the protagonist doesn’t hurt at all. 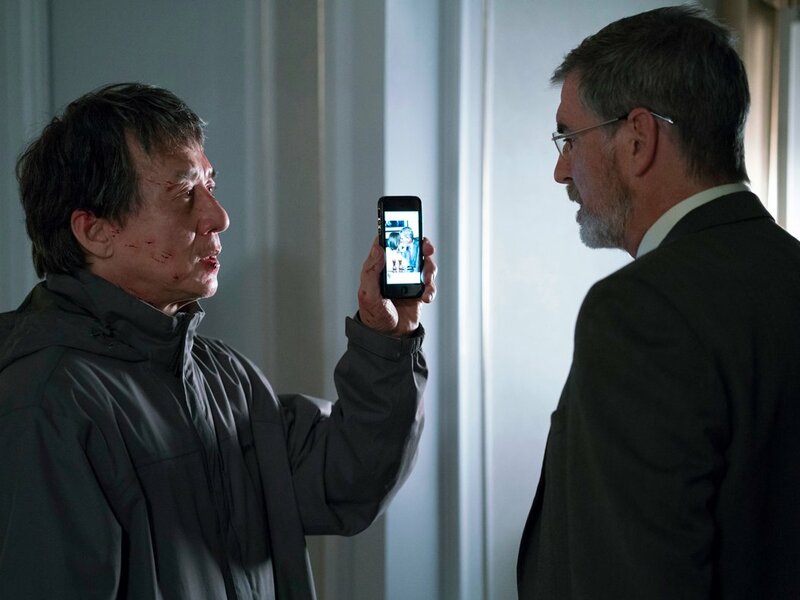 He plays Quan, the deceptively unassuming owner of a Chinese restaurant in London, whose daughter Fan (Katie Leung) is among the dozen killed in a brutal terrorist attack just as she’s shopping for a dress to the school dance. She was the only family left for Quan, who lost the rest of it years ago. Needless to say, the man launches his own investigation. It was the work of the “Authentic IRA,” possibly a rogue cell in the official IRA and a thorn in the side of Liam Hennessy (Pierce Brosnan, really digging into his natural Irish accent), a former member who denounced its violence in the past and who is now the Deputy Minister of Northern Ireland. Political infighting has left the possibility of peace in question (The film is certainly of its time, given the subject and the themes related to globalism), but that is the least interesting part of David Marconi’s screenplay (based on the novel The Chinaman by Stephen Leather), which is at its best when designing comeuppances on the part of Quan, whose determination matches only his meticulousness. Chan’s performance is key here, and it’s quite good, convincing in the wake of sudden tragedy and as an aging man pushed to the limits of his physicality. Merely the task of carrying heavy gym bags, filled with chemicals to create explosives, up the stairs of a hotel causes panting, sweating, and the brief need to sit and catch his breath. He manages to keep up with his attackers in the sequences of hand-to-hand combat (breathlessly staged and executed by director Martin Campbell), but it’s not without a staggered leap between staircases or a slower response in the beats between blows. This is not Chan as a comically invincible hero, clearly, but a man as vulnerable – both physically and emotionally – as anyone else. The actor’s presence is remarkably potent in such a role, even as the story shifts in favor of some wheel-spinning regarding Hennessy’s place in all of this, which involves the usual behind-closed-doors backstabbing and discreet motives. It’s a bit predictable, not only because Brosnan’s performance isn’t exactly hiding much about the character’s nature, but also because we’ve seen this sort of thing before. The wrench in the works, in many ways, is the presence of Chan. He’s the grounding element in The Foreigner, sleek pulp whose tension outweighs formula.